Long-time FOIA advocates Senator Cornyn, left, and Senator Leahy, standing, introduced the bipartisan FOIA Improvement Act. Mark Wilson/Getty Images. Washington, DC, June 24, 2014 – Congress may actually take action this year to strengthen the Freedom of Information Act, according to the National Security Archive's posting today of the new bipartisan bill by leading U.S. 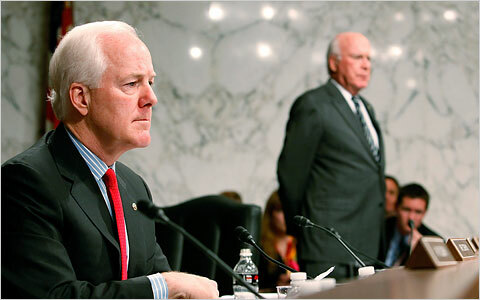 Senators Patrick Leahy (D-VT) and John Cornyn (R-TX). The Leahy-Cornyn bill, the FOIA Improvement Act of 2014, would rein in the government's ability to withhold "inter-agency or intra-agency memorandums or letters" merely by citing the Exemption Five "pre-decisional" black hole, an exemption	most recently stretched to include a 30-year-old CIA draft history of the 53-year-old Bay of Pigs Invasion. The FOIA Improvement Act of 2014 also strengthens the FOIA ombuds Office of Government Information Services, promotes more proactive online access to government information, and pushes back on agency attempts to weaken the 2007 Open Government Act's fee improvements (also authored by Cornyn and Leahy). The Senate bill directly addresses regulatory shortcomings exposed by three National Security Archive government-wide FOIA audits. 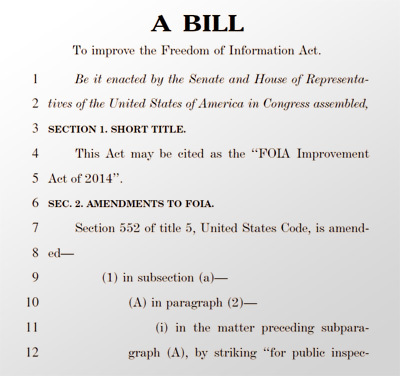 The Senate bill comes after the House unanimously passed its own bipartisan FOIA reform bill, cosponsored by Representatives Darrell Issa (R-CA), Elijah Cummings (D-MD), and Mike Quigley (D-IL). The FOIA Oversight and Implementation Act, passed by the House in February 2014, also strengthens OGIS, encourages proactive disclosure, and requires agencies to update their FOIA regulations within 180 days of the bill's passage. The Rise of B(5). Chart by Lauren Harper, compiled from AP statistics. The most important new aspect of the Leahy-Cornyn bill is its fix to the FOIA's fifth exemption, often called the "withhold it because you want to " exemption due to its expansive scope and discretionary application. 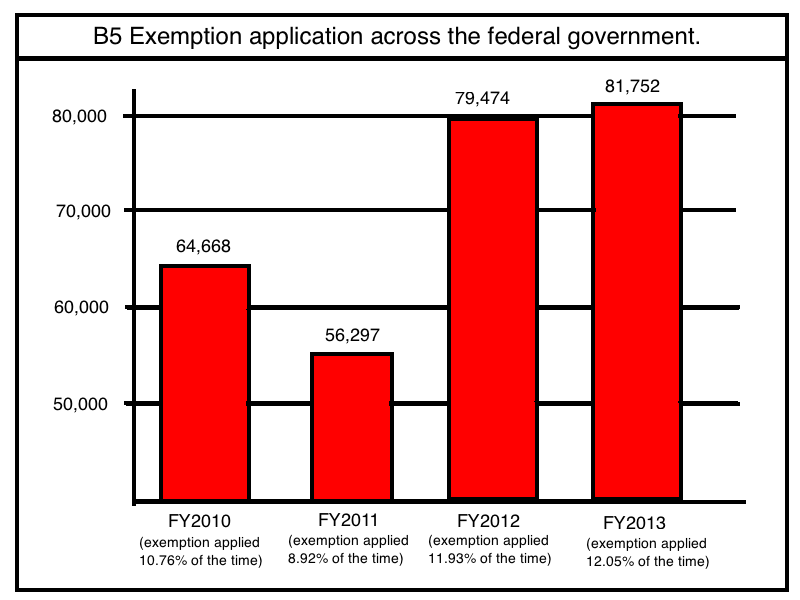 After a brief dip at the beginning of the Obama administration, the government's use of this exemption has skyrocketed. In fiscal year 2013, agencies cited the fifth exemption 81,752 times, to deny 12.05 percent of all FOIA requests, according to statistics compiled by the Associated Press. In one recent egregious case, the Central Intelligence Agency and Department of Justice argued to the DC Circuit Court of Appeals that they should be allowed to use Exemption Five to withhold a 30-year-old draft history of the 53-year-old Bay of Pigs invasion because, they argued, it could "confuse the public." In a two-to-one decision, the court sided with the government, writing that, "unlike some statutes, such as certain provisions of the Presidential Records Act… Exemption 5 of FOIA does not contain a time limit. We must adhere to the text of FOIA and cannot judicially invent a new time limit for Exemption 5." The Leahy-Cornyn bill sets a 25-year sunset for Exemption Five claims, and adds a public interest balancing test to the requirements for agencies to invoke the exemption, among other provisions. "Given that the House has already acted, and that both bills are bipartisan, prospects for genuine FOIA reform in 2014 may well be sunny," commented Nate Jones, FOIA Coordinator of the Archive.